Luxury lifestyle outlet Robb Report took to Napa Valley this weekend for its 2018 Car of the Year testing, but according to news reports and social media accounts, it ended badly for all involved. Five people were injured in one crash, and another apparent wreck trashed a Ferrari 812 Superfast. Update: The Ford apparently wasn’t part of the testing. The Napa Valley Register reports that on Saturday afternoon, a 2018 Ford was traveling westbound on Highway 128 at Meadowood when it “crossed the center line for unknown reasons.” The Ford hit an oncoming 2014 Honda in a head-on collision. As a result, Highway 128 was closed in both directions so that at least one person could be airlifted to Queen of the Valley hospital. Three people in the Ford were transported to Queen of the Valley Medical Center after the wreck – the driver, 43-year-old Cristina Cheever of Encino, and passengers Darin Greenblatt, 52, of Los Angeles and Ashley Chung, 41, of La Crescenta. Also injured and taken to the Queen was 42-year-old Phillip Benson of Sacramento, a passenger in the Honda. The woman driving the Honda, 41-year-old Taryn Benson of Sacramento, was transported to Santa Rosa Memorial Hospital. Cristina Cheever, according to her LinkedIn profile, is the senior vice president of live media at Penske Media Corporation, which owns Robb Report. Darin Greenblatt is the director of live media events for the magazine. Ashley Chung was identified by the TFL Car as one of the judges for the 2018 Car of the Year and represents Korean Air, which is sponsoring the event, so she may have been a guest of the magazine. The California Highway Patrol posted the following video on its Facebook page on Saturday. The current status of the five involved is currently unknown. Following the incident, a Twitter user claimed to have witnessed supercars, all wearing Robb Report license plates, driving erratically. 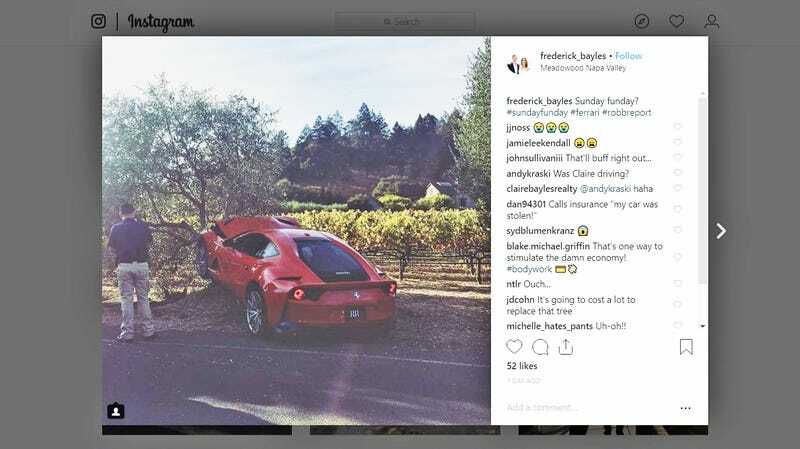 Separately, Frederick Bayles posted a photo of a crashed Ferrari 812 Superfast to his personal Instagram yesterday. The post was tagged in Meadowood Napa Valley and the car can be seen wearing Robb Report plates. It is not believed that the Ferrari was involved in the Ford and Honda crash. We have reached out to Robb Report for comment and will update if we hear back. Update 12:41 p.m. EST: A California Highway Patrol spokesperson provided Jalopnik with a press release of the collision. The specific Ford and Honda models were not identified, but it stated that Greenblatt was sitting in the right front passenger seat of the Ford and Chung was sitting behind the driver. Update Nov. 7, 2018, 5:08 p.m. EST: Sources familiar with the matter told The Drive that the Ford Cheever was driving wasn’t part of the outlet’s Car of the Year event. She apparently was offsite for an unrelated reason. Ms. Cheever suffered serious head injuries in the head-on collision and was airlifted to the hospital. She is now conscious, and while in serious condition is expected to make a recovery. Darin Greenblatt, a fellow Robb Report staffer, suffered neck injuries as well as serious internal injuries from his seatbelt but is expected to make a full recovery.